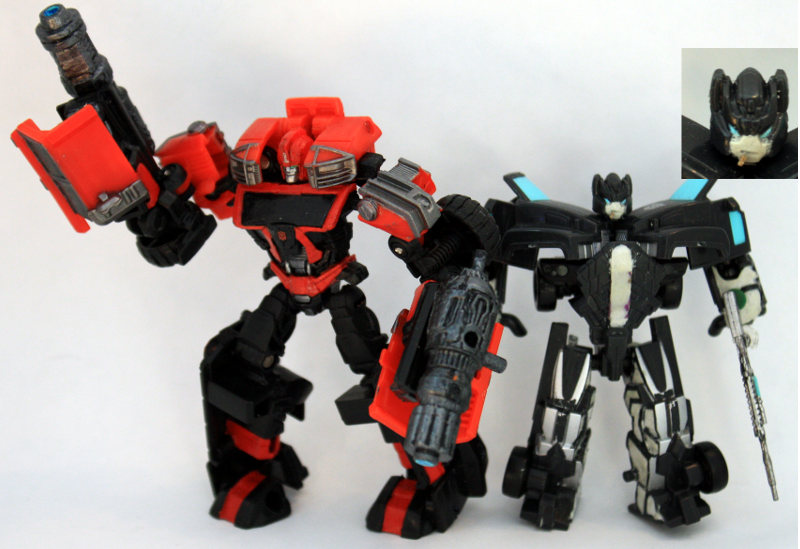 Short & sweet: I collect cyberverse figs (takes up less space, easier on the wallet). Almost all of them have received, or are receiving various degrees of customization. I'm a fan of the Prime and MMTE aesthetic, so expect to see that pop up frequently - anyone with a face has it updated to a Prime-y noseless face. Starting off small; here's my Warpath. Made from a movieverse Gutcruncher/Sparkcrusher, I wanted to play up the "Robots in Disguise" angle and not have Warpath turn into a bright red tank, with only his concealed robot mode parts being his signature color. 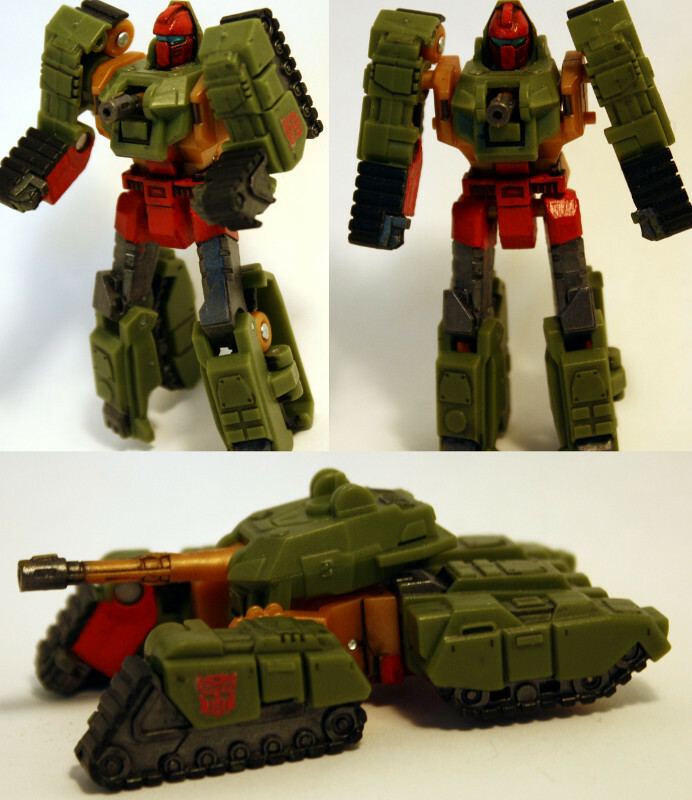 As a minibot tank, I like to think he scanned one of those one-man minitanks that pops up in fiction occasionally. Motto: ""Hit it till it stands no taller than the dust!''" Thank you! One of the modified face fellas (a work-in-progress Kup w/ Cygar) is next in the photography line. For now, here's Roadbuster and Chopshop. As you can probably tell, I'm a fan of fluorescent orange! Roadbuster's head's been trimmed down/resculpted a bit, to remove the hat/mullet design from DotM. A painted/shortened Halo megabloks weapon is used as a Pathblaster. If I start selling customs, I'll probably switch over to matte orange - fluorescent photographs poorly. Maybe you can make Cyberverse Transformers in G1 Colors? G1's definitely a big inspiration (that's why Roadbuster got all his orange bits), but some characters will wind up being G1-er than others - Dion, for instance, is going to be 100% creamy G1. 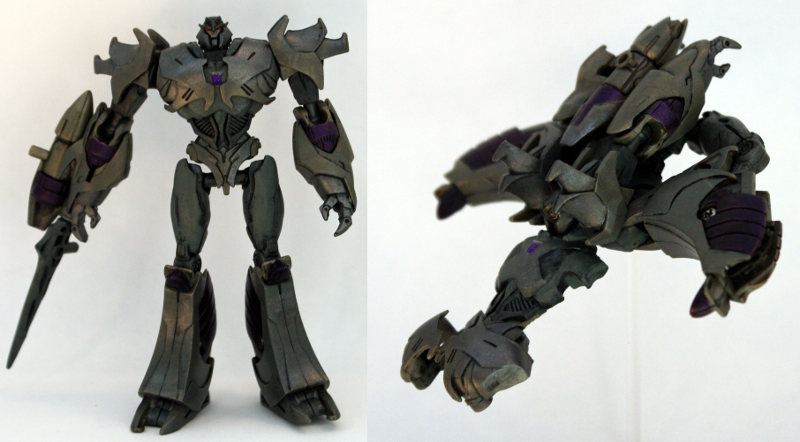 Also, I've nearly got some voyager G1 AoE Grimlocks ready! 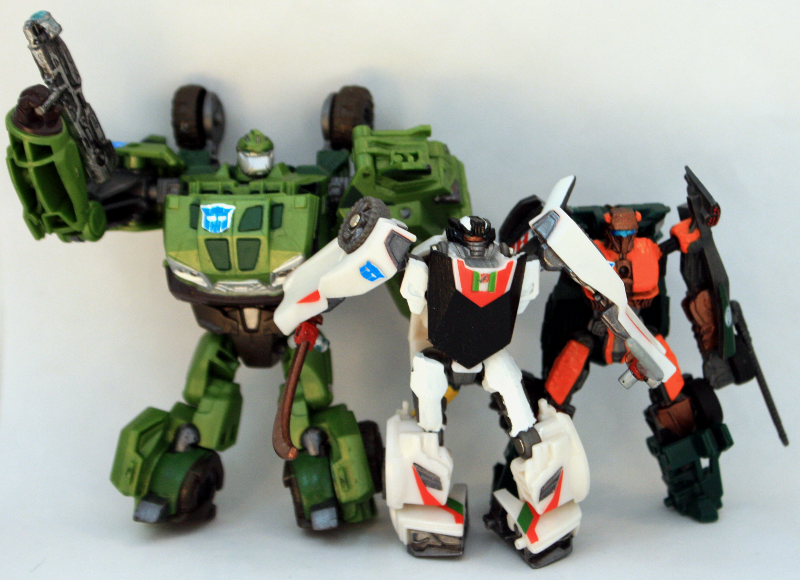 First, Roadbuster is joined by fellow Wreckers, Bulkhead and Wheeljack. Only minor alterations; Bulk's got a few details painted in, trans-blue covered and been given a kitbashed weapon based on the one Magnus gave him. Wheeljack has some color-tweaks in homage to Armada Wheeljack, who first introduced the idea of the character being a loner/warrior. 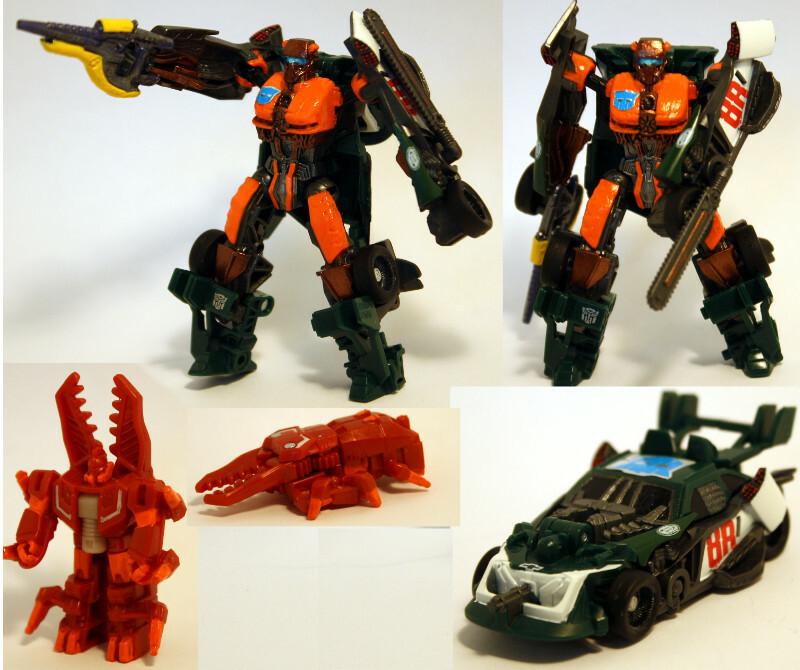 His Autobrand is scarred, but his Wreckers badge is bright and proud - he's loyal to the Wreckers, not the 'bots. Besides the obvious change of the trans-purple to grey, I've added almost a centimeter of spacer to his thighs, so he towers over foes. Fortunately, it didn't muck up his altmode. I'm a big fan of Megatron's Prime design - it manages to work in plenty of the G1 detail (the "grip" on his legs, for example), but it doesn't feel forced. Still gotta make him a Dark Saber. A minor mod and a WIP - Ironhide has some additional deco and his arm cannons were lengthened with RotF Ironhide's guns - I like that asymmetrical look! Beside him is the complete, unpainted, cygar-smoking Kup, made from the aforementioned RotF Ironhide. He's a little bit buff for a Kup, but the mold still feels like a decent fit. He has some sculpted on details to make him a bit Prime-er, and hands/laser musket made from Halo Megabloks bits - they're perfect for Cyberverse customs; a collection of hands, weapons, hinges and balljoints to use. I found his Targetmaster bits kinda clunky, and Wasp's too awesome to just be someone else's gun With a megabloks bit at its core, he was given a handheld stinger and his black/yellow details. 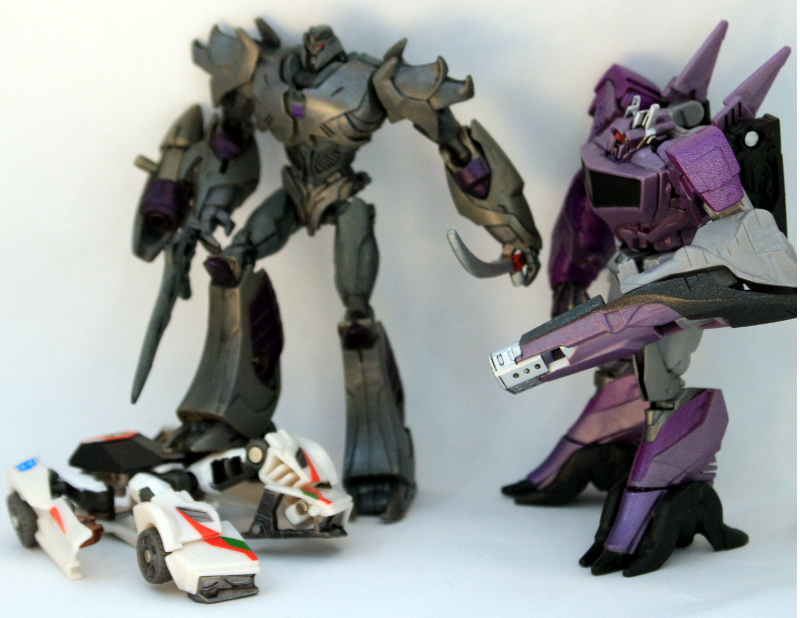 Why don't you show your bots to Hasbro because they are so nice. I want them. Thanks! 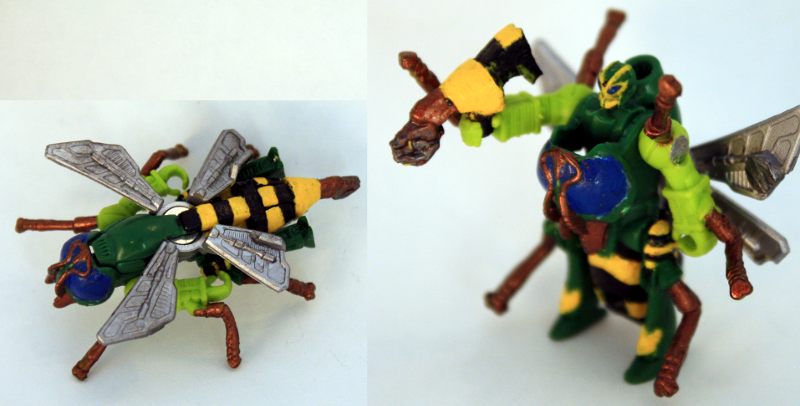 I feel kinda bad for the designers who worked on targetmaster Waspinator; they must've been dying to have the black & yellow stripes, but the curved shape and dark green plastic would've meant having it factory-painted would've required a ridiculous amount of sprays. Must be frustrating for stuff like that to interfere with the design process. Unfortunately, I'm going to have to take a month's hiatus from posting customs (in a different country for intern-purposes). 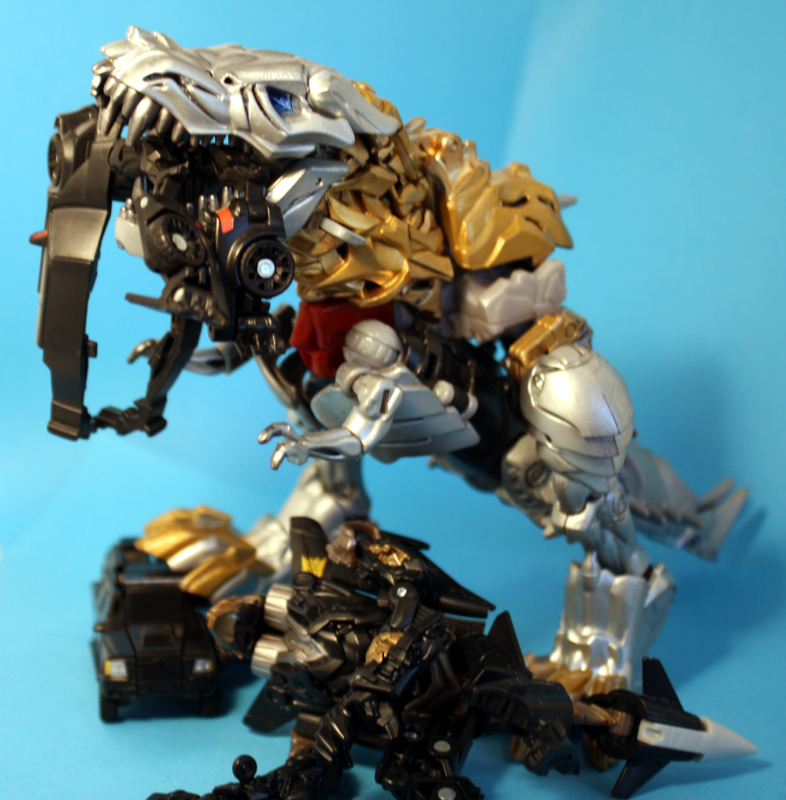 As a send-off, here's a custom Grimlock chewing on the DotM Dreads (they make great Genericons!). Maybe you can better use the transformers toys of The 2007 Movie with a cam eye.